LinguisitcsNetwork distinguishes itself from other academic sites in the field by offering over 100 self-correcting exercises in all major areas of linguistics (including a new section for speech pathology majors). Each exercise begins with a basic overview of the material covered and brief instructions. Students are then directed to a compilation of between 5-20 questions. 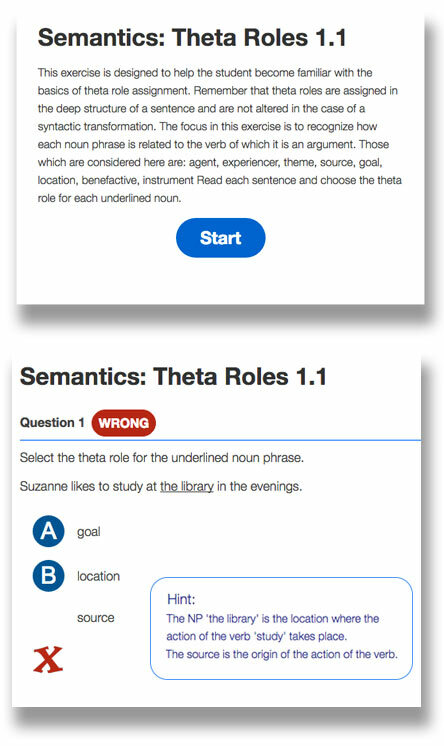 When the incorrect response is selected, students are provided an explanation about their choice and shown the correct response. There are three levels of exercises. The 1.1 exercises are the most basic, and developed at an introductory level. At the end of each of these, students have the option of reading a brief and more in-depth tutorial on the subject matter at hand, as well as trying their hand at a 1.2 level exercise on the same material, which provides more practice at a slightly more challenging level. We are currently working on our 2.2 level of exercises which are geared for students who already have studied linguistics. There is no limit to the number of times an exercise can be retaken. This material has generally been developed for the undergraduate student, basing questions on a wide variety of well-respected textbooks, primary source articles, and linguists who have gathered data for research purposes. We have found that many graduate students use our exercises for review and filling in gaps of information, especially when transferring to new universities. Visit our self-correcting exercises page!